Trump’s Repeal of the Deferred Action for Childhood Arrivals (DACA). Will the Courts Save the Dreamers? The Trump administration’s rescission of Deferred Action for Childhood Arrivals (DACA) has been met with widespread resistance by people across the political spectrum. Thousands have marched in the streets to save the “Dreamers” from deportation. Human rights and civil liberties organizations as well as legislators on both sides of the aisle condemned the ending of DACA. Donald Trump‘s attorney general Jeff Sessions announced the impending termination of DACA on September 5, 2017, disingenuously claiming it was necessary to forestall a looming legal challenge by 10 state attorneys general. Sessions cited no legal authority for his assertion that DACA was unconstitutional. In fact, no court has ever found DACA to be unlawful. Trump’s tweet was not reassuring. In fact, it was not inconsistent with Sessions’ announcement, which also said no action would be taken against the Dreamers for six months; then the axe will fall. Trump’s “No action!” tweet indicates he is being pulled in different directions — by his right-wing nativist base, on the one hand, and by the majority of the population who oppose his heartless act, on the other. So, what’s next? Will Congress save DACA? Will Trump reinstate it if Congress doesn’t? Or does the fate of DACA rest with the courts? Congress is now under pressure to reinstitute DACA within six months. Congressional action could take one of three forms. First, Congress might defy years of history and agree on comprehensive immigration reform. Second, Congress could pass a stand-alone bill legalizing DACA. For example, the BRIDGE Act would enshrine DACA into law and extend it for three additional years to give Congress time to enact comprehensive immigration reform. The Dream Act of 2017 includes protections similar to DACA, but, unlike DACA and the BRIDGE Act, it would create a path for citizenship or permanent legal residency. In any event, the chances of Congress acting in any meaningful way to save DACA in the next six months are slim to none. That leaves the fate of the Dreamers with the courts. The day after Trump rescinded DACA, attorneys general from 15 states and the District of Columbia filed a lawsuit against Trump and his administration in the United States District Court for the Eastern District of New York. They asked the court to declare that the rescission of DACA violated the Constitution and federal statutes. The plaintiffs also requested an injunction preventing Trump from rescinding DACA and forbidding him from using personal information the Dreamers provided in their DACA applications to deport them or their families. The states signing on as plaintiffs in this lawsuit are New York, Massachusetts, Washington, Connecticut, Delaware, District of Columbia, Hawaii, Illinois, Iowa, New Mexico, North Carolina, Oregon, Pennsylvania, Rhode Island, Vermont and Virginia. California, home to more than 240,000 DACA recipients, the largest number in the country, filed its own lawsuit on September 11. “Rescinding DACA will cause harm to hundreds of thousands of the States’ residents, injure State-run colleges and universities, upset the States’ workplaces, damage the States’ economies, hurt State-based companies, and disrupt the States’ statutory and regulatory interests,” the complaint alleges. It specified the number of DACA or DACA-eligible recipients, the amount of revenue each state would lose, and other injuries the rescission would cause. The plaintiffs argue that Trump’s DACA rescission violates the Constitution’s Equal Protection and Due Process Clauses, the Administrative Procedure Act and the Regulatory Flexibility Act. More than 78 percent of DACA recipients are of Mexican origin. During the presidential campaign, Trump repeatedly made disparaging and racist comments about Mexicans. And two weeks before rescinding DACA, Trump pardoned the notorious racist, former Maricopa County Sheriff Joe Arpaio, whom Trump called “an American patriot.” Arpaio had been convicted of criminal contempt for refusing to comply with a court order to stop racially profiling Latinos. Thus, the complaint says, defendants violated the Equal Protection Clause of the Fifth Amendment. A similar allegation has been leveled against Trump’s Muslim Ban, which singles out Muslims for discriminatory treatment. As in State of New York et al v. Donald Trump et al, equal protection challenges to the ban cite several anti-Muslim statements Trump made. The Supreme Court will decide the constitutionality of the ban when its new term begins in October. Since the DACA program’s launch in 2012, the DHS repeatedly promised applicants that the information they provided in their applications would “not later be used for immigration enforcement purposes.” This reassurance encouraged applications. Using information such as names, addresses, social security numbers, fingerprints, photographs and dates of entry into the United States for immigration enforcement would be “fundamentally unfair” and thus would violate due process, according to the complaint. The complaint also alleges that in rescinding DACA with “minimal formal guidance,” federal agencies acted “arbitrarily and capriciously,” in violation of the Administrative Procedure Act (APA), 5 U.S.C. § 706(2). In addition, 5 U.S.C. §§ 553 and 706(2)(D) of the APA require federal agencies to “conduct formal rule making before engaging in action that impacts substantive rights.” Defendants did not go through the notice-and-comment rulemaking required by the APA. Finally, the complaint claims that defendants violated the Regulatory Flexibility Act, 5 U.S.C. §§ 601-612, which requires federal agencies to analyze the impact of rules they promulgate on small entities and publish initial and final versions of those analyses for public comment. The complaint states that deferred action, such as the DACA program, is a well-established form of prosecutorial discretion. Congress and the Supreme Court have acknowledged that the executive branch has the authority to grant deferred action for humanitarian reasons. That has included certain categories of people, including victims of crimes and human trafficking, students affected by Hurricane Katrina and widows of US citizens. Presidents from both parties have deferred immigration action to protect certain groups. Dwight D. Eisenhower, John F. Kennedy and Lyndon B. Johnson permitted Cubans to remain in the United States before Congress enacted legislation to allow them to stay. Ronald Reagan allowed about 200,000 Nicaraguan immigrants to remain in the US even though Congress had not passed authorizing legislation. And George H.W. Bush permitted almost 200,000 Salvadorans fleeing civil war to stay in the US. Janet Napolitano created the DACA program in 2012, while serving as secretary of homeland security in the Obama administration. Now, as president of the University of California (UC), she has filed a lawsuit in the US District Court in Northern California against Trump to save DACA, alleging violations of due process and the APA. 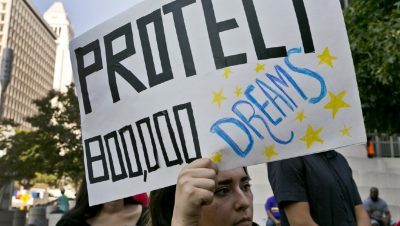 “Defendants compound the irrationality of their decision by failing to acknowledge the profound reliance interests implicated by DACA and the hundreds of thousands of individuals, employers, and universities who will be substantially harmed by the termination of the program,” the UC complaint states. Napolitano promised that UC campuses will continue to provide undocumented immigrant students with free legal services, financial aid and loans, and will order campus police to refrain from contacting, detaining, interrogating or arresting people solely on the basis of their immigration status. How Would the Supreme Court Rule? If Congress or Trump were to reinstate DACA, these legal challenges may become moot. But if the lawsuits proceed and ultimately reach the Supreme Court, what are the justices likely to do? After Scalia’s death, but before Neil Gorsuch joined the Court, the justices split 4-to-4 in United States v. Texas. That tie left in place a circuit court decision striking down the Obama program called Deferred Action for Parents of Americans (DAPA) and an expanded version of DACA. Gorsuch would likely have broken the tie by voting against DAPA. But the core of DACA has never been litigated. A lawsuit challenging DACA was thrown out of court for lack of jurisdiction. The Muslim Ban case could serve as a bellwether of DACA’s fate in the high court. In a temporary order, the Court left parts of the ban in place pending its decision on the merits. Three justices — Alito, Thomas and Gorsuch — would have allowed the ban to continue in its entirety. They would also probably defer to Trump in the DACA case. It remains to be seen how the remaining justices would rule. Chief Justice Roberts is generally conservative but is very concerned about the legacy of the Roberts Court, which led him to side with the liberals in upholding the Affordable Care Act. Will the DACA case be remembered like Brown v. Board of Education, the most significant civil rights case in US history? Or will Roberts’s legacy be tarnished by a result that looks more like the infamous Korematsu v. United States, in which, under the guise of national security, the Supreme Court upheld the president’s power to lock up people of Japanese descent in internment camps during World War II? The bottom line is that if Trump has the opportunity to appoint one or more additional justices to the high court, DACA may well be struck down. Marjorie Cohn is professor emerita at Thomas Jefferson School of Law, former president of the National Lawyers Guild and deputy secretary general of the International Association of Democratic Lawyers. Her books include The United States and Torture: Interrogation, Incarceration, and Abuse; Cowboy Republic: Six Ways the Bush Gang Has Defied the Law and Drones and Targeted Killing: Legal, Moral, and Geopolitical Issues. Visit her website: MarjorieCohn.com. Follow her on Twitter: @MarjorieCohn. Featured image is from Washington Examiner.